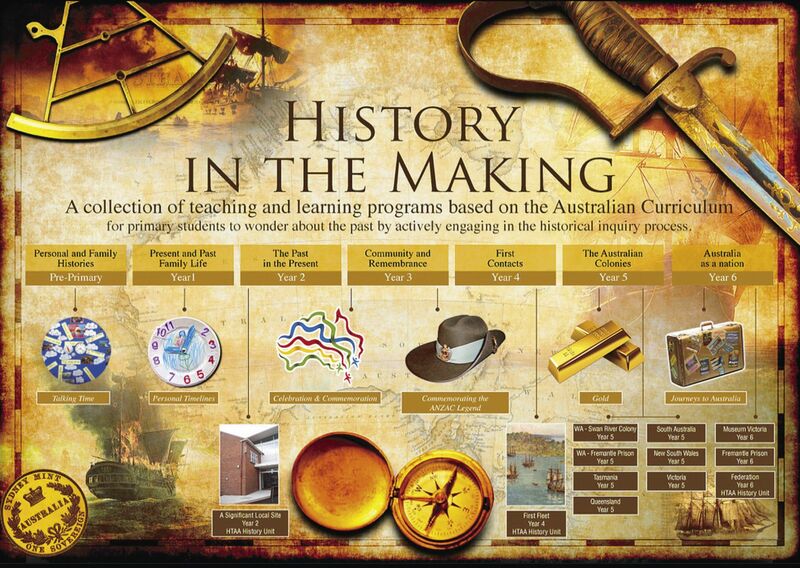 ​This project was a Professional Learning experience for primary teachers of History, providing a framework to write teaching and learning programs based on their implementation of the Australian History Curriculum. The outcome is a range of AC History units published as an online teacher resource to be shared with the wider Education community. The Association of Independent Schools of Western Australia (AISWA) developed and managed the project, led by Maree Whiteley, AISWA Humanities Consultant and Primary Years Consultant for the History Teachers Association Australia (HTAA). AISWA acknowledge the collaboration of the History Teachers Association of Victoria (HTAV) during the writing phase of this project. Click here to access the free History in the Making resource. Disclaimer: The information contained in this publication is to the best of our knowledge and belief correct at time of publication. However, no warranty or guarantee is or can be provided by AISWA or any member of its staff, and no liability is or can be accepted for any loss or damage resulting from any person relying on or using the information contained in this publication. AISWA values education and equality of all students within Western Australia. However, the views expressed in this publication by the individual schools and organisations who participated in the project that resulted in the publication are their own and do not necessarily represent the views of AISWA. Copyright: This publication was produced for use by educators in Australian schools. Acknowledgement of the Association of Independent Schools of Western Australia would be appreciated in doing so. This material may be used, reproduced and communicated free of charge for non-commercial educational purposes, provided all acknowledgements are retained. This material is exempt from collection by copyright agencies.